Map footfall and activity in your pool, gymnasium, spa, salon, yoga center, or any other service-based business with our Members Retention Dashboard. The dashboard is specifically designed to track gym subscriptions, average membership periods (months, years, or more), professional demographics that dominate, and other important metrics. Improve your marketing campaigns by knowing just who to target and which time-slots to pitch. 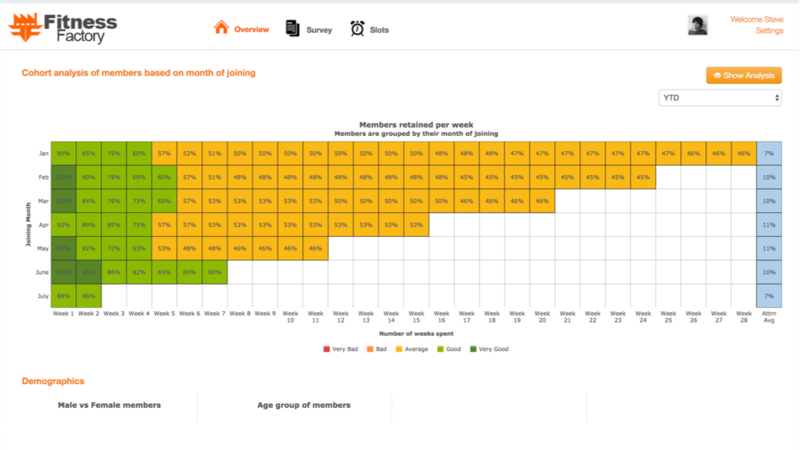 View cohort analysis results of member attrition & retention rates and understand exactly what’s changing month on month. Cohort analysis shows exactly how January’s 81 members reached 37 by July, with the majority leaving in January and February. Map membership numbers to active/past events & campaigns to know if you’re on the right track. Access quick-view pie charts that break down key demographic segments – male/female, age, tenure, and profession. Store and showcase customer survey results in a unified platform, correlating member opinion to outcomes - for instance, 16.5% members joined because of good ambience, but 12.6% left citing ambience as a cause. This suggest ambience might have been marketed as a pro, however led to members being disappointed. Share with colleagues via profile-based login, boosting collaborating and encouraging new business ideas.